These brownies are rich and fudgy. You can make them in one bowl. And they have those perfect shiny tops we all want our brownies to have. So what else is there? They're low-FODMAP and gluten free! Brownies are easily my favorite homemade dessert. Because chocolate. The moist, fudgy-style brownies I love call for very little flour, so subbing in a gluten-free variety is a cinch. In this recipe, I used the King Arthur Multi-Purpose Gluten-Free Flour blend. You need less than 1/2 cup. Another key ingredient is cocoa powder, which lets you get it all done in one bowl. Instead of melting solid chocolate on the stovetop or in the microwave, you just mix the cocoa in with the butter and sugar. There is plenty of satisfying chocolate flavor in these brownies already, but I have always, always loved chocolate chips in my brownies. In this recipe, 3/4 cup is plenty, and that amount keeps you well under the 30g low-FODMAP serving size for dark chocolate. Be aware of portion size if eating a lot of dietary fat sets off your digestive symptoms. It also helps to pair a rich dessert like this with a low-fat meal. You can also leave out the chocolate chips--they're totally optional, and the brownies are great without them. Skipping them might be a good idea if you're doing the elimination phase so you don't risk an upset stomach. Since my birthday is this week, I went all out with the chocolate. 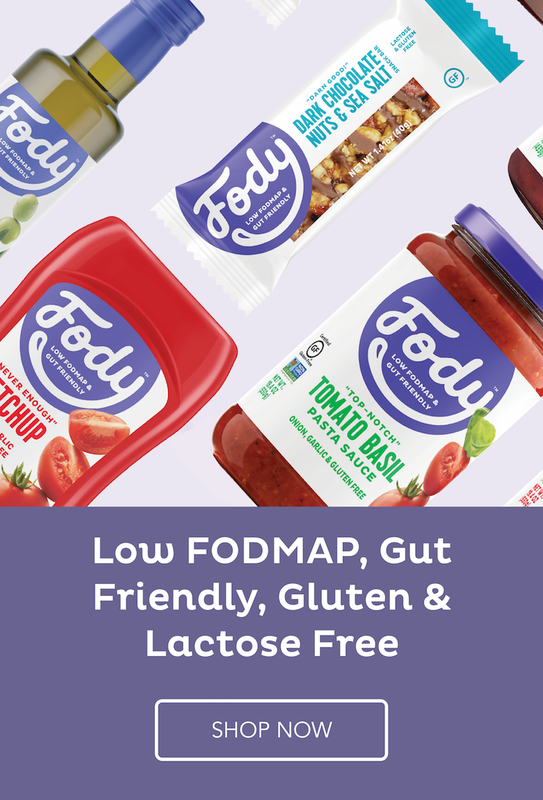 The low-FODMAP diet may be restrictive, especially in the early stages, but it's not a deprivation diet. I think it helps to have treats we love that still fit in with our goals. I'm also the biggest believer of indulging in moderation. Which is really helpful when you have a sweet tooth. 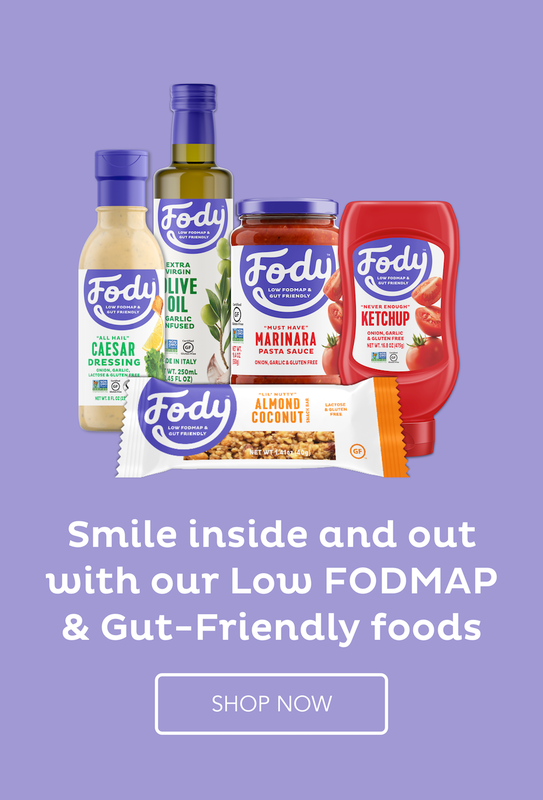 What are your favorite low-FODMAP treats? With the holidays coming, I'm looking for great cookie recipes, so send 'em my way! If you want to add the optional chocolate chips, I used Ghirardelli Bittersweet, but I also like the Enjoy Life brand for dairy free chips. An equal amount of chopped walnuts or pecans would be great too. If you're in the elimination phase I recommend skipping the chips and nuts, especially if your belly is sensitive to fat. These brownies are still amazing! 1. Preheat oven to 350F. Line 8 x 8-inch baking pan (I used a light-colored metal pan) with nonstick foil or parchment paper, leaving an overhang on 2 opposite sides. 2. In a large, microwave-safe bowl, combine the sugar, butter, cocoa, espresso powder if using, and salt. Microwave in 20 to 30-second bursts, stirring each time, until butter is melted. Stir until combined (mixture will be very grainy). Stir in the vanilla. 3. Add the eggs one at a time, stirring until combined after each one. Stir until the batter is thick and shiny. Add the flour and stir until thoroughly combined and no white streaks remain. Stir in chips if using. Spread evenly in prepared pan. 4. Bake until a toothpick comes out with a moist crumbs, 30 to 34 minutes (mine took 32). The top should be puffed and shiny and the brownies pulling away from the sides of the pan. Cool completely on a wire rack. Cut into 12 or 16 brownies. For a perfectly clean cut, put the cooled brownies into the refrigerator or freezer until cold (don't freeze completely). For storage, these freeze really well. You can wrap individual brownies in plastic wrap and store in a ziploc bag. Defrost at room temperature.